Location: Near Balvatnet, Norland, but in Sweden. Difficulty: YDS class 3 (winter). How to get there: A good starting point is the DNT hut Čoarvi. Check out the description for Nord Saulo in order to locate this hut. Route description: The route starts out in the same way as the route to Nord Saulo. From the Čoarvi hut, head up the gentle slope towards the east, crossing a small lake (658m) and then up to a smaller lake at elevation 700 meter. From here, continue through the small pass south of the mountain Juhtar and descend on the east side. Continue south on the east side of lake Balvatnet. It may pay to climb to about 740 meter, thus cutting across part of the plateau north of Vuotsas (826m). A well marked trail (used by snow scooters?) crosses from Balvatnet and through the saddle just north of Vuotsas, connecting to the large Swedish lake Mavasjaure (547m). 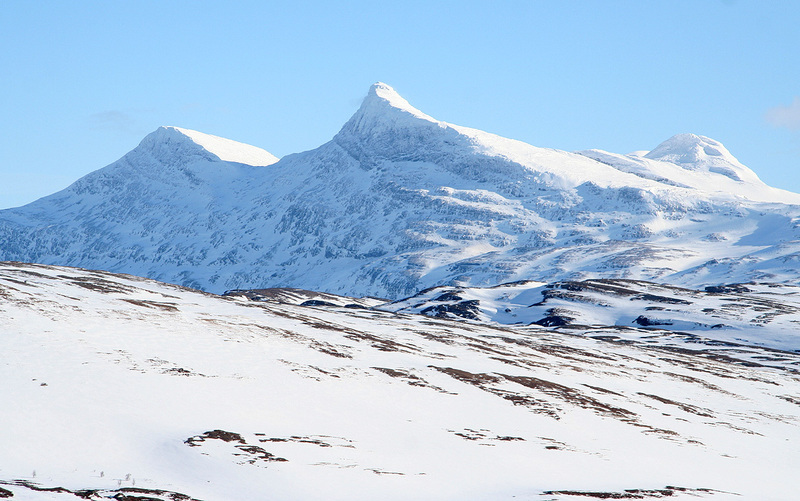 This saddle at (660-680m) is also the prominence saddle for Årjep Saulo. The route crosses a bit north-west of Vuotsas, traveses west of the mountain and descends into the valley forming Båtskardet. From here, one proceeds to climb the mountain. Find a way up the initially steep slope with scattered cliffs. Above 1000 meter, you enter a rather flat section about 2 kilometer long, before entering the main ridge at about 1200 meter. Follow this ridge as it climbs, stay away from the north side as it is very steep. Higher up, the ridge becomes more distinct as you approach the crux that can be seen on photos from far away. The summit ridge above comes down and makes a rather distinct step. Proceed up to the left, fortunately, there is a small but reassuring distance to the large vertical north face at this point. The weak point is about halfway up. Here, the ridge is pretty low and a few steps cut by your axe should suffice to make you pull up and back onto the top ridge. The ridge is more narrow and has a few more steps, however, not very difficult. Then the slope eases and with a few more meter you approach the quite well defined cairn. Comments: The weatherforecast called for a reasonably nice day with sunshine, however this was not to be. We started out in gray weather at 0715, knowing that we had a long trip with many unknowns ahead of us. After one hour, we were well along the shore of Balvatnet. This side had large patches of land where all the snow had gone. Good for the small herds of reindeer that could be seen here and there, not quite as ideal for two men on skis. We aimed for lines and patches of snow, but still ended up traversing many hundred meter of snowfree land before crossing the well marked route across from Balvatnet to Mavasjaure. 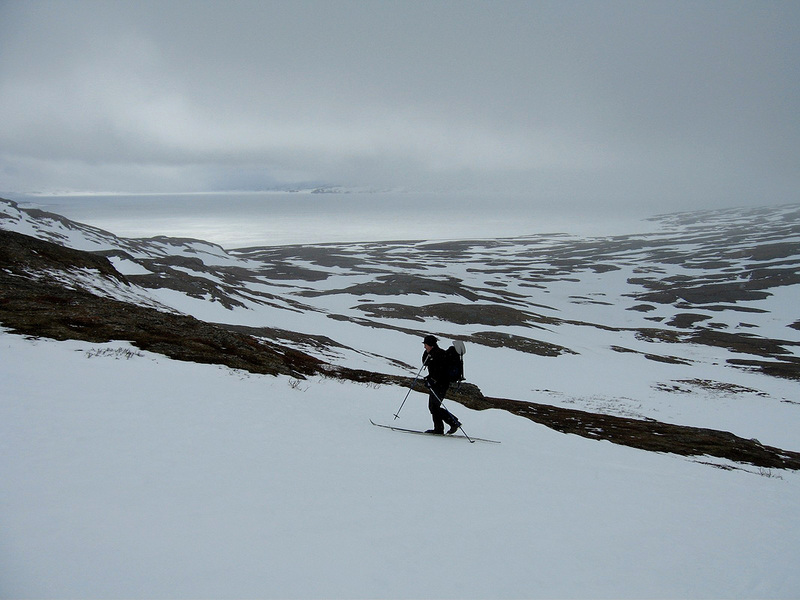 We skied west of Vuotsas and into Båtskardet. The mountain disappeared directly up into the clouds and this made it difficult to decide on the best route upwards. Looking at the slope going up into the clouds, skiing did not look all that easy. The lower part of the mountain had many cliffs and steeper slopes partly without snow. We headed more or less straight uphill, initially on some rather good sized patches of snow. Soon, the terrain got much steeper and I advanced up a route that seemed better for summer than winter skiing. A short ramp right, then along a rather narrow shelf with vertical cliffs below and above. A few more sections of steep uphill skiing and we topped out at the edge of the flatter section. Visibility was now definitely poor. We proceeded carefully and located the beginning of the ridge proper. A bit later, we stood below the steep ridge that towered above us. Carefully exploring the downhill slope on our left as it vanished into the void, we decided that there was enough protection to advance along the steep side above us to a point that looked feasible to climb. 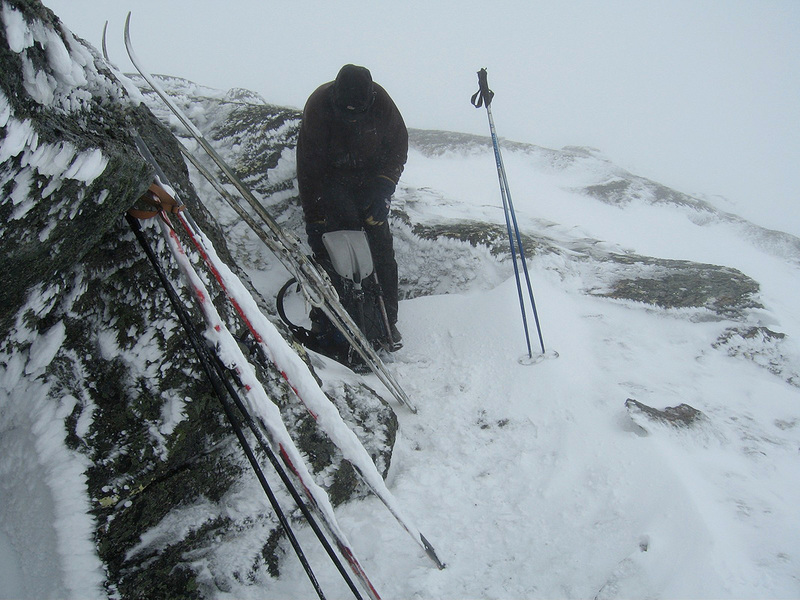 I cut a few steps and noticed that the snow was very bad, no support even from an ice axe sunk entirely into the snow. 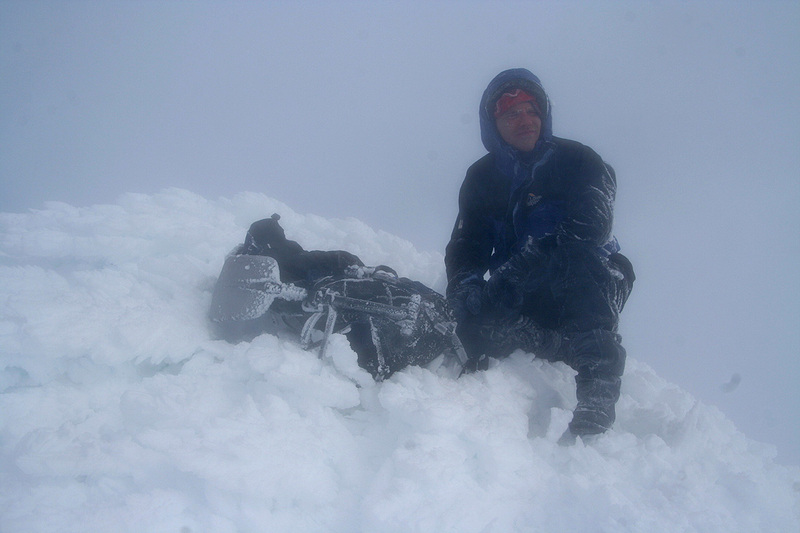 The step did not support my weight and indeed there was vertical rock just 10 centimeter through the snow. After a bit of further exploration, I had a good feel for the way up and made a short scramble, lifting and pulling myself onto the snow above. 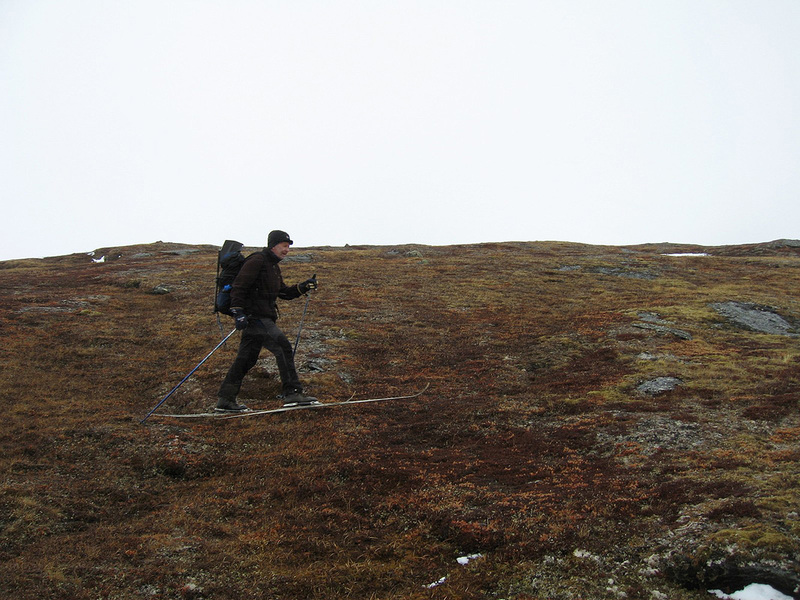 Åke quickly followed and the next couple of steps in the ridge were slightly smaller. This part had been completely unknown to us. It was a good feeling to see that we indeed would reach the summit. 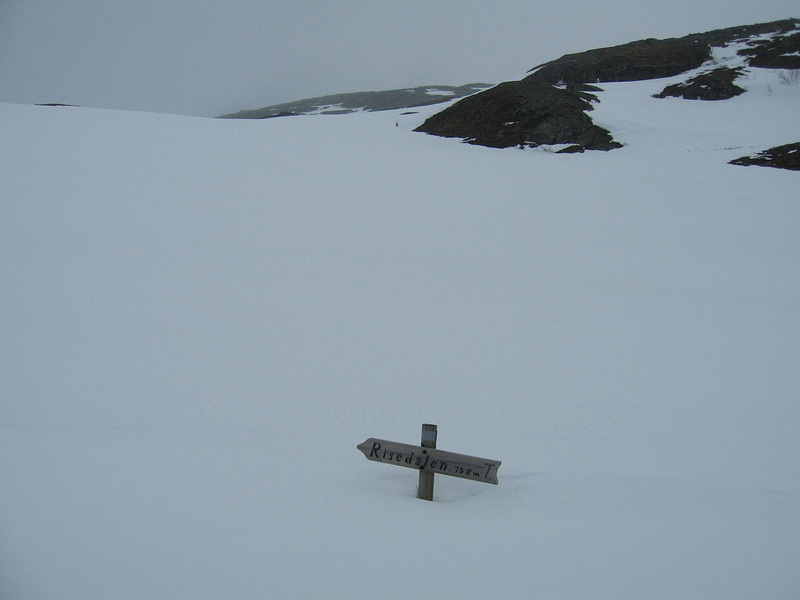 The summit was quite distinct and a pretty big hump revealed the cairn buried under snow. The time was 1345, just as yesterday, however we started slightly earlier today. The weather was interesting. 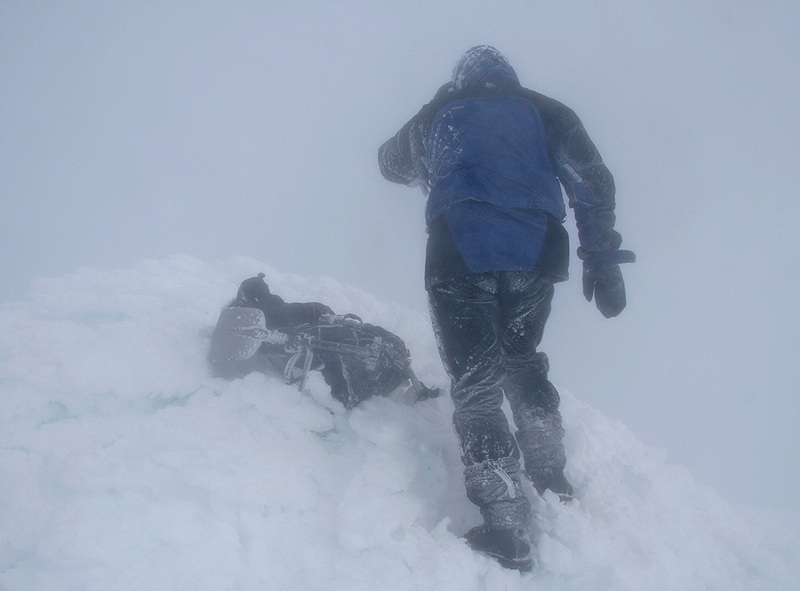 We could see patches of blue sky above us, nothing below and the local wind carried blizzard conditions. I pulled out my camera and immediately noticed a layer of about 5mm ice coating it, lens, camera house, everything. Not good. We pulled off a few pictures then prepared for descending. The pictures below clearly shows the weather impact. We descended, first back down to the skis, then further down the ridge. With zero visibility this descent was rather cumbersome. We had to be quite careful and use the GPS extensively. With somewhat steep slopes and scattered rocks the descent just took much longer than what would have been the case with visibility. The skiing back to the hut from Båtskardet went quite well and we arrived back at the hut at 1900, total trip time 11:45. A nice couple from the Netherlands had arrived and we therefore returned to a warm hut. We had dinner and a well deserved rest before hitting the bed fairly early. The next morning, we got up at 0330, started skiing back towards our car at 0400 on good crust. We reached the car in 1:45, about 45 minutes faster than the ski in. Åke had a train from Fauske, I had a flight from Bodø already around 1000 the same morning. A very good trip had come to an end. Four very prominent peaks in five days. About 40 hours of actual skiing and hiking. Thanks to Åke for very good company on two pretty remotely located peaks that required care and proper route finding. Årjep Saulo as seen from Juhtar. 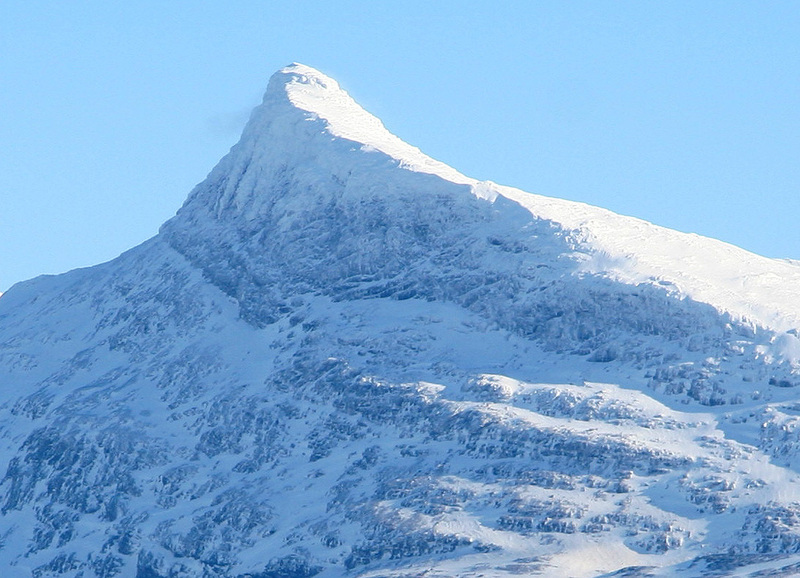 Årjep Saulo, the summit with the (YDS) class 3 step clearly visible. The face is 1000 meter high. The last steps to the summit. Note the conditions. 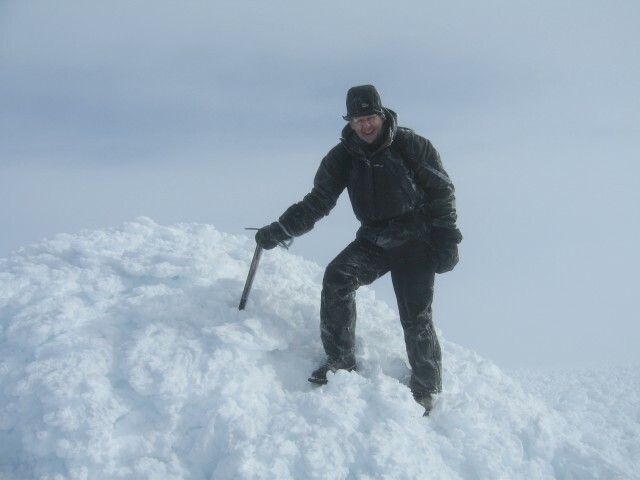 Geir Åke Dahlen at the summit. 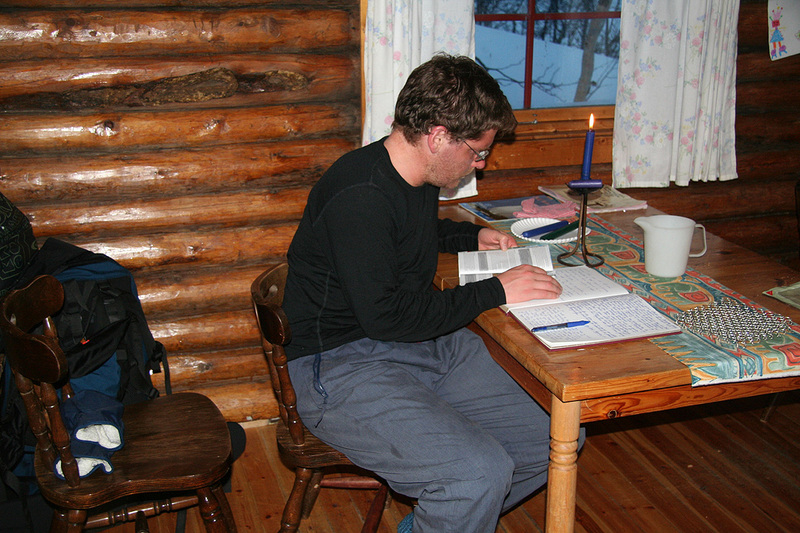 Back in the hut, writing an entry about the two climbs. The Dutch couple, having spent more than 20 years in Norwegian mountains.